It is vital for the global corporate oligarchy to undertake unconventional forms of economic warfare so as to get control of Venezuela’s wealth and its geostrategic position. 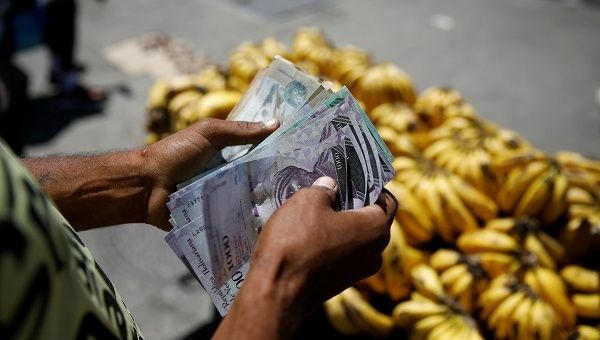 April 20 (teleSUR) On April 17, Venezuela‘s Vice-President Tareck El Aissami reported that in the Hands of Paper Operation – an exceptional measure taken at a critical moment – 86 people were detained, among them Colombian nationals linked to cash contraband and exchange rate speculation against the Venezuelan bolivar. El Aissami said the operation targeted networks affecting Venezuela’s economic system and impacting Venezuelans’ quality of life. The government’s security and crime prevention units have been investigating for months. Vice-President El Aissami said many businesses had been visited, a great number of them ghost companies. He also confirmed that authorities have confiscated cash, including foreign currency in dollars and Colombian pesos. The operation had as a central player Carlos Eduardo Marron, accused of spreading false exchange rate information, money laundering and conspiracy. “This individual was responsible for rigging and imposing the criminal dollar rate to strike against and destabilize Venezuela’s financial system,” El Aissami said. Marron is director of event company Venelatin Productions, based in Miami, with operations in the United States, Colombia, Panama and Peru. The firm is linked to the ticket trading business Tuticket, based in Coral Gables in southern Florida. By means of these economic activities, Venelatin Productions fomented the circulation of foreign currencies and their speculative accumulation. The La Tabla investigative website reports that Marron is also director of a Panamanian company created in 2007 jointly with Ramon Marron Moreno and Raquel Azpurua de Marron, members of the editorial committee of Gentiuno magazine. The publication’s directors include journalist Eleonora Bruzual, Marianella Salazar and writer Alfredo Coronil Hartman, stepson of former Venezuelan President Romulo Betancourt. This network was not merely financial and economic, but also sought to deepen the political impact of the devaluation induced by business networks hidden behind web portals and communications media. Also worthy of note is the role of Banesco Universal Bank in the exchange rate fraud scheme that’s part of the multifaceted war against Venezuela. This bank is based in the Venezuelan capital and has been operating since 2013 in Colombia. Since 2015, it has served as the Cucuta exchange rate mafias’ best ally at different levels and in various dimensions. In both countries, each experiencing significant migration, family remittances are an important component of the Gross Domestic Product, because it is a way to accumulate foreign currency. For years, that accumulation has worked via the banks which hold onto foreign currency and serve as foreign exchange offices beyond Venezuela’s borders. That’s how the so-called ‘exodus’ of Venezuelans has turned into big business for certain financial operators, who take advantage of the accelerating devaluation of Venezuela’s bolivar to capture more foreign exchange on the parallel market. Also of note is that, from the bank accounts that have now been closed, transfers were made to people who took the cash to the border where they exchanged it at up to three times its value. For that reason, the government is trying to intensify investigations into banking entities that lend their technological platforms for criminal financial activity as a political tactic affecting Venezuela’s economic sovereignty. Many people cross the Colombian-Venezuelan frontier so as to exchange bolivars at higher rates. The prerequisites are to have cash in hand and a bank account in Venezuela, preferably in Banesco Universal Bank, so as to be able to get cash the same day. The Colombian government has allowed the criminal structures that form a regular part of their economy to control exchange rate business along the border with Venezuela. That’s why El Aissami accused Colombian President Juan Manuel Santos of protecting the mafias in Cucuta and Maicao responsible for the boycott of Venezuela’s currency. Investigative writer Oscar Javier Forero reports that criminal activities such as drug trafficking, which give dynamism to Colombia’s economy, have created an informal alternative financial market to the banks: one which operates like them but is unsupervised and unregulated. These are the foreign exchange offices. Cash contraband seeks to launder money and supply very large quantities of Venezuelan bolivars to the financial markets along the Venezuelan-Colombian border so as to constantly devalue the bolivar and thus ensure extraordinary profits as a result. Since there is a shortage of Colombian pesos, the value of the Colombian currency remains stable and stimulates the extraction of products from Venezuela (including bolivars in cash) and this also stimulates scarcity and under-supply. Oscar Javier Forero says the total amount of money circulating along the frontier axis of San Antonio-Ureña-Cucuta is unknown, but in 2015 Colombia’s Congress calculated that it was around US$7 billion annually. The actions of the Colombian elite against Venezuela are part of a global plan in which their drug trafficking generates great quantities of money to grease not just the Colombian economy but, above all, the economies of the United States and Europe. Along the Colombian-Venezuelan frontier, the link is self-evident between the illicit drugs economy, paramilitary activity and other parallel economies in Colombia. This interaction works as a financial warfare mechanism to damage Venezuela’s sovereignty in accordance with the geopolitical objectives of the United States. In that context, the powerful private Banesco Universal Bank serves as a faithful, technologically competent intermediary, guaranteeing the deposit and disbursement of these irregular flows of money that provoke a brutal devaluation of Venezuela’s currency.